I was ordering a veggie wrap from a local sandwich shop recently and was offered the option of several different types of hummus, including sweet potato hummus. First, I love that I live in an age of so much variety that I can stop into a little suburban to-go restaurant and have the option of several different types of hummus available for my sandwich. But more importantly, I love that this little shop inspired my latest addictive snack, curry spice sweet potato hummus. Baked, puréed sweet potato is wonderful with hummus on its own. But then I add a bit of pure maple syrup to bring out the sweetness in the sweet potato, plus tasty spices like curry powder, cinnamon, and ginger to add tons of rich flavor. This hummus is thick, rich, creamy, unique, slightly sweet and really flavorful. It’s so, so good with cinnamon pita chips. And also a tasty, slightly sweet complement to savory sandwiches. 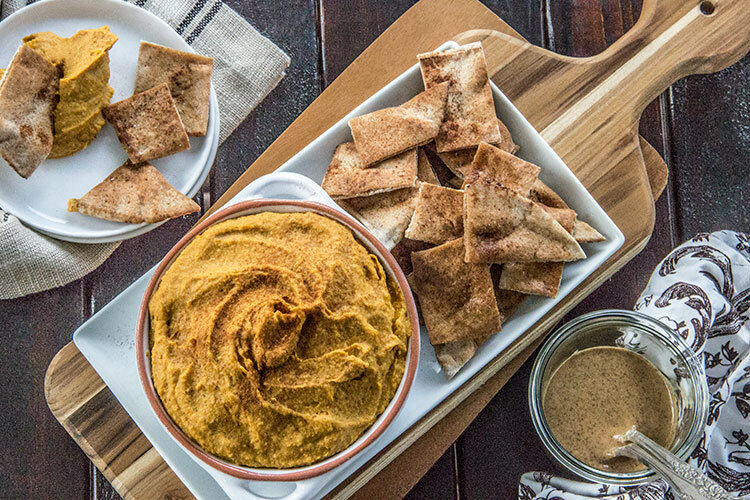 Here’s the recipe for Curry Spice Sweet Potato Hummus. I love this hummus when I’m craving a rich, creamy, slightly sweet snack (it holds up well when stored in the fridge in a covered, airtight container). It’s a satisfying and filling treat, and the curry adds such a unique, flavorful twist!